I know I’m not the only one who has been mesmerized by the animated film, “Frozen”, nor the only one who has written about it. (For some reason, it hit me that I needed to write about it now, so here it is!) So many wonderful songs, yet in particular, I adore the song Elsa sings when she escapes into the mountains to set herself free, “Let it go.” This incredible story has captured so many for many different reasons. However, the theme is about your inner gifts, talents & power. The “magic” Elsa has was hidden by fears from those around her, and then she adopted the fears, being afraid of hurting anyone. She needed to be the perfect girl her parents thought she needed to be. When her biggest fears are realized, she escapes and stays hidden, although the timing of the song “Let it go” is perfect. She is coming into an understanding of herself, yet is still struggling, as we all do, as we accept ourselves and learn our own hidden treasures. And, yes they are treasures to be revealed, not hidden. For like, Elsa, when she fully understands what her gifts are meant to do and how to be fully in her gifts, she is transformed! Love. Love is the power that is part of all of us which will allow us to reveal our treasures, our gifts, our talents, our power…fully in all their glory. No fears to be had, for Love is the cure to fear. Yes, Love. It’s time to unleash your power. What gifts are you hiding? Why are you trying to be perfect? What has been programmed into you that is ready to be set free? What fears are hindering your progress? Why? 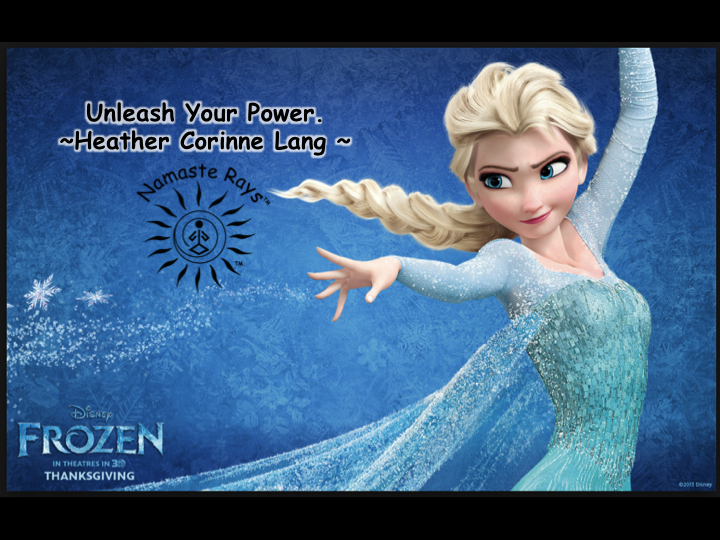 Are you ready to “Let it go”? If not, why? If yes, what are you waiting for? You are the only one who can own your power and allow yourself to do what you are truly destined to do with Love. Love yourself and your gifts. The gifts you are given were for a purpose in this lifetime. As I’ve mentioned, I’ve come into my gifts over time, and didn’t think anyone would “listen” to me and my truths. This is from past lifetimes, versus this one. A learned behavior my soul carried from lifetime to lifetime. In this one, I’m meant to unleash my power. My truths. My gifts. My treasures. From others, I’ve been told by quite a few my writing is helpful. Therefore, one of my talents is communication through the written word. I heard the messages I was being given. So, I stopped hiding and started writing. Small notes, long notes and emails, and now this blog site where anyone who stumbles upon it can read my words if they so desire. I’ve said to many over the past decade “I’m an Open Book”. True…and another song in this delightful movie is “Love is an Open Door.” This song has so many levels of meaning, it staggers my mind. But again, it’s all about Love. If you do not open your door, Love can’t come in. Yes, you have inner Love, but by hiding, you will not experience it, as it is through sharing we experience our Love of self. Gifts we give others, we receive several to many times over. I share my beliefs, feelings, thoughts and more here and elsewhere, always with Love. Love gives me the courage, strength, understanding & wisdom to share my inner truths. These are my shining treasures I now choose to share, not being concerned about what others think. For, this is my path…that is their path. Perhaps the paths shall meet, cross or merge for a time or more, but I need to be concerned about my path for my soul’s journey. Those who resonant with me and like my path will find one similar and I’m always willing to help & guide those who wish to be helped. That is another way I’ve unleashed my power. I’m meant to help others, to help others heal and to help others unleash their inner truths, gifts and power. Therefore, I’m not fearful of showing my power. If you want help answering the questions above and unleashing your power with Love, Understanding & Kindness, contact me at heatherclang@yahoo.com, or find me on Facebook at http://www.facebook.com/NamasteRaysNews.Sunshine and send me a note there. Healing energy and guidance are within your reach. May you unleash your power! Thank you so very kindly for Shining the Rays on your page!